During the last couple of weeks I have listed hundreds of domains that are part of an ongoing spam campaign advertising bogus “Work at home jobs”. 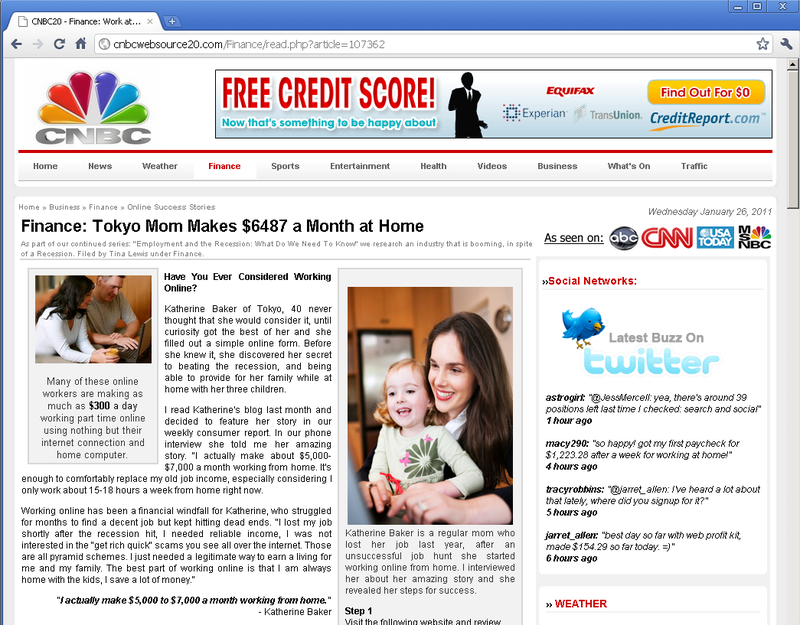 The websites advertised by these spams were designed to look like they belong to commercial TV channels, sometimes illegally including the CNBC logo and many of the domain names contain terms like “cnbc”, “nbc”, “abc” or “news”. The fact that these people illegally use trademarks of major corporations should already be a major red flag. This is not just some dubious get-rich-quick scheme, is is the work of a criminal operation. The sites are hosted in different countries, including the US, Russia, China and Romania. The registrant details that can be looked up via WHOIS often only list a proxy service. We just had to find out… So we set out to do some research ourselves. 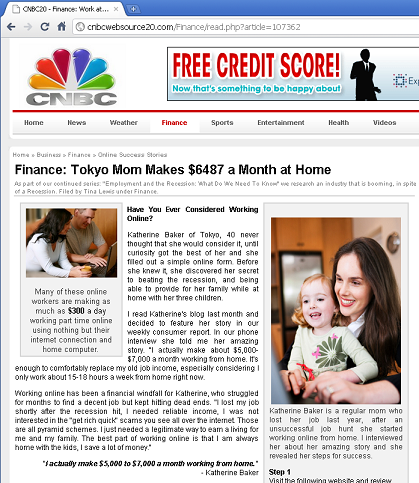 We came across a blog by Jessica Holmes of Tokyo, 40. Oh, Tokyo? By sheer coincidence that’s where I live. But looking at the source of the website, I could see that the HTML code simply looks up the IP address from which the site is accessed and outputs the city associated with it. If you were reading the same article from an IP address in Baltimore it would say that “Jessica Holmes” lived in Baltimore! That little bit of cheating and the attempt to be mistaken for commercial TV channel websites are just the tip of the iceberg of this criminal scam. In an attempt to avoid being caught by spam filters, many of the spams abuse URL shortening services such as bit.ly or redi.ec to hide the domain names of the fake news sites that are getting blacklisted by us. Many of the spams appear to have been sent from hacked Hotmail, Gmail and AOL mail accounts. The spam appears designed to get unemployed people to pay $97 dollars upfront (“Can $97 Really Turn Into $6795?” headline on the fake site) in the hope of being able to support their families with whatever is offered, when they’re really only going to support the criminals who run this scam. Signs of deception or hidden identities.